In July 1993, the City of Mitcham Council carried out a study of the storm water drainage system along Cross Road. It is here that two large pipe systems join into a single pipe under Cross Road and the stormwater flows into the Patawalonga outlet and then into the St Vincent Gulf at Glenelg. Due to increasing areas of hard surfaces like roads, rooves and paved areas the volume of stormwater flowing through this system was too large for the pipe system resulting in regular flooding of Urrbrae Agricultural High School Farm Lands and local streets. As a result it was decided that a water detention should be constructed by diverting the water from the two inlet pipes into the Urrbrae Wetland, with an outlet pipe delivering the overflow water from the Wetland into the existing stormwater pipe under Cross Road. Funds to build the Wetland were provided by the City of Mitcham, Department of Transport and the Patawalonga Catchment Board. The land itself is part of Urrbrae Agricultural High School and is owned by the school and DECS. 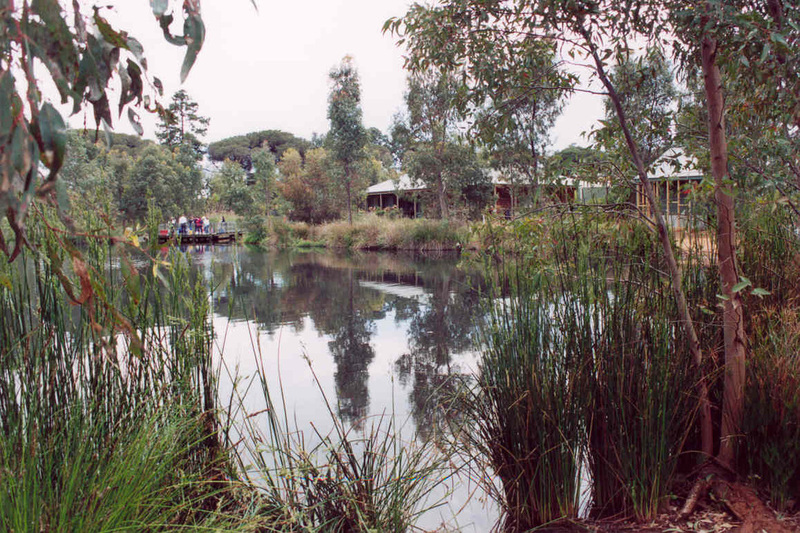 The facility is currently managed by the City of Mitcham with Urrbrae Agricultural High School managing the education side and a volunteer group called the Friends of the Urrbrae Wetlands manages the vegetation and day to day maintenance. With cooperation the Wetland was opened on April 9th 1997. High School were involved in conducting depth profiles of the main pond along set transects, and soon discovered that the maximum depth had plummeted from 3m to 2m in only five years. As a result of their findings the two sedimentation ponds were added in 2003. As well as controlling and cleaning stormwater, Urrbrae Wetland also provides an invaluable habitat for a wide variety of animals including over 50 species of birds. These animals are able to find refuge in their urban surroundings because the wetland is planted with over 100 different species that are considered 'local' or endemic to the area; meaning they are believed to have grown in the area prior to European settlement in 1836. The overall landscape represents a 'grey box grassy woodland', containing tall trees, shrubs, grasses, shoreline plants and aquatic plants.